You love toting your favorite music with you to the gym. You have your pump-up jams, your lifting anthems, and the songs you just can’t finish your 10-mile run without. Without your exercise audio, you’re left listening to the whir of treadmills and clanking weights. As much as we love piping in music to keep us going, we all know the drama that comes with earphones that don’t stay put. You jump, you lift, you do some plyometrics and agility—ultimately, you move around a lot. A slippery silicone earphone just can’t stay put. No matter how snugly you cram it into your ear canal, the rubber simply slips at the first sign of sweat. We understand this struggle far too well, which is exactly why we’ve tirelessly invested in creating an earphone tip replacement that enables your earbuds to stay put until you say otherwise. Comply™ Sport Pro 400 foam tips have been precision engineered to stay with you set after set, mile after mile. Patented viscoelastic memory foam has been crafted into the ideal shape for your ear canal. Whether you’re a professional athlete or a weekend warrior, Comply™ tips will stay with you through rest days and twice-a-days. Stay-put Technology for Serious Workouts: The proprietary materials created by Comply™ makes sure these foam tips stay in place. The secure fit is guaranteed by the memory foam that was made to activate with your body heat and expand to fit your ear canal’s individual shape and size. Comply™ foam gives these tips 400% more grip than standard silicone rubber earphone tips. So get in 400% more sweating without even a budge. Comfort for Every Ear: In addition to providing superior grip, the bad boys are 10 times thicker than silicone rubber. This cushion means you can expect an earbud that is 30 times softer, so you can say goodbye to the achy ears and listening fatigue that always kicked in halfway through a long workout or practice. Plus, this extra thickness means serious sound isolation. Think about it as sound-proofing your ears—trap in great audio while sealing out the pitter patter of gym sounds and sneakers. New and Improved SweatGuard™ Protection: When the workouts get tough, the debris can build up. Comply™ wants to keep your listening machine clean and pristine. 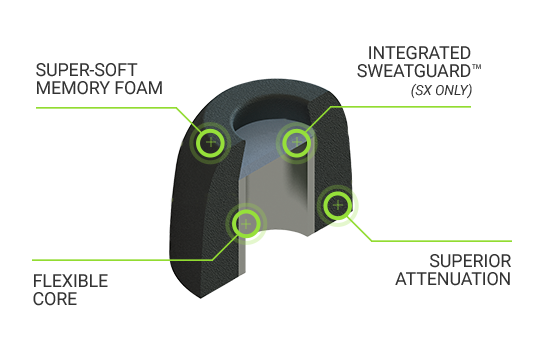 Our innovative SweatGuard seamlessly integrates an acoustically transparent filter inside each foam tip. This addition means moisture, sweat, earwax and other gunk out of your headphone’s soundports for crisp and clear listening.